Metamorphic Waves is the latest album from Sequential Dreams, one of several recording aliases of Canada-based electronic music composer Ron Charron. 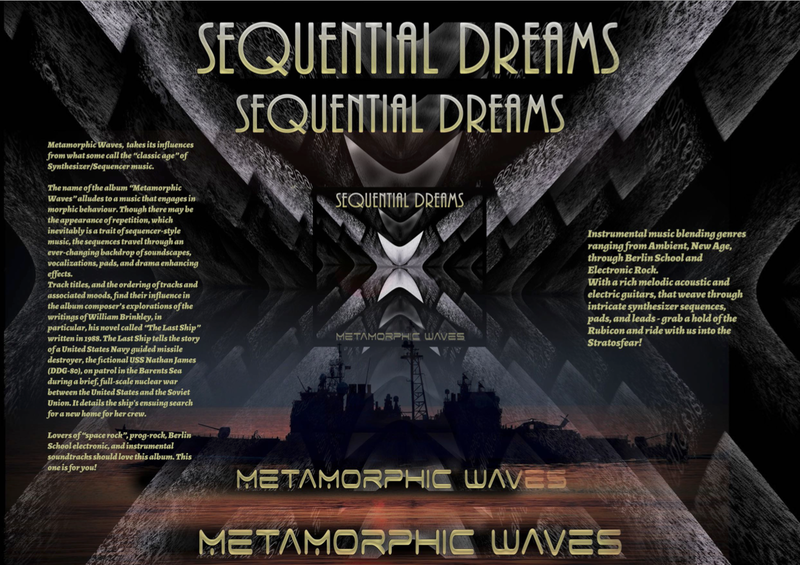 The tenth installment in the Sequential Dreams series, Metamorphic Waves was particularly inspired by Tangerine Dream’s Force Majeure era, expounding on the band’s late 70’s and early 80’s signature electronic music style – much to the extent that this album often convincingly sounds like it was recorded on the very same equipment! Comprised of six compositions spanning a little over an hour, each piece ranges from approximately nine to twelve minutes in length, with Ron incorporating various elements of ambient, Berlin-school, progressive rock and electronic space music into his layered arrangements. Melodically dynamic and rhythmic throughout, the album showcases a spectacular array of adventurous sci-fi soundscapes, classic sequencer motifs and cosmic vocalizations, as the true spirit of vintage synthesizer music is effectively transferred to the modern era. The opening piece, “The Last Ship”, is initially introduced by a wobbly drone before unfolding like a medley throughout over a span of nine minutes. Seemingly embarking on a far-flung space voyage, the piece is guided along by dynamic rhythms that are laced with progressive rock and accompanying electric guitar reminiscent of Pink Floyd. At about a third of the way into the composition, the drums gently fade as sequencers emerge to the forefront seguing into a very Tangerine Dream-like motif, which seemingly evokes that of travelling through a space tunnel filled with pulsing laser lights. “Beyond Darkness” is introduced by a gorgeous ambient soundscape full of blissful dreaminess, effectively bringing-to-mind images of an astronaut floating in space. Choppy vocal samples and a sequenced bassline soon follow as they eventually unfold into a rhythmically driving arrangement of drums, guitar and synthesizer. My favorite piece on the album is easily “Submariners”, which opens with spooky deep-sea effects that seemingly conjure up scenes from underwater sci-fi movies such as Leviathan and The Abyss. A hazy mist of angelic tones drift in and out of the listening space, as if the voyager is traversing the oceanic depths of an alien planet while observing strange lifeforms below. A beautifully dreamlike yet foreboding soundscape, it eventually unfolds into a mesmerizing sequencer pattern in classic Tangerine Dream fashion. Visit the Journeyscapes site and listen to great online radio! This time, Ron Charron laid the foundations of “Metamorphic Waves” alone. No collaboration coming from the 4 corners of the planet and that suits him very well. I would even dare to move forward that this last album of Sequential Dreams is the most inspired and most inspiring album of the project of the Quebec musician. Of course the Tangerine Dream's essences are still present there, in particular those of Edgar Froese with a greater use of a guitar which is as melancholic as in the structures of Dalinotopia, I think among others of "The Island" and its approach more inspired by the Sonic Poem Series. But little by little we feel a detachment. We feel this will that has Ron Charron to release himself from the influences of his inspirations to have his own signature. And at this level, we can say that “Metamorphic Waves” makes a big step forward. "The Last Ship" begins by a sea agitated of its oscillating waves. They mutter and resound, swallowing even the charms of a light and small serpentine of sequences which loses its brightness. Some 45 seconds farther, a line of the sequencer jumps up with its keys which dance freely. The percussions which arrive confirm the spasmodic approach to the rhythm which explodes with salvoes of guitar. Dark chords and other livelier arpeggios squabble in the background while the rhythm always remains so convulsive up until it hits an uncertain phase. While the sequences flicker in breezes, grave chords resound of their austere tones, injecting a small dramatic dose enriched by layers of voices. This transitory interlude will lead "The Last Ship" towards a structure amplifying of intensity which is abundantly watered by guitar solos and by riffs of an acoustic guitar. We feel Edgar's presence, especially at the level of the effects, without having the impression on the other hand of an imitation. "Beyond Darkness" bears its name marvelously. The introduction is dark and weaved of lugubrious effects. Fluty breaths and mysterious breezes flood my ears, while very Floydian chords meditates on Ron's keyboard. A gradation attracts the vibes towards a mistier passage but nevertheless charming with arpeggios which melt once they have reach my ears. A strange choir settles down a little before the 4th minutes, exciting of their pinkish breaths a heavy movement of the sequencer which spreads the bases of an ambient electronic rock loaded by the memories of TD in their Force Majeure era. A period, according to me, too short in the history of the Dream. Surfing between the ambient and the cerebral rhythm mode, "Beyond Darkness" changes of skin. Bringing face to face a synth and its solos against a howling guitar. There is no room for drowsiness in this “Metamorphic Waves” because Ron Charron plays constantly on his phases by placing elements of highly varied rock in electronic decorations which go back in time. At this level, "The Submariners" is a big title with a beautiful complexity in its evolution which plunges us into the universe of Force Majeure. This is huge music! "The Search" is another huge title with a very lively rhythm hammered by good and powerful percussions. The rhythm is steady, a little as in Silver Scale (as reference point), with sequences which run under the intensive bludgeoning of the percussions. Keyboards throw riffs as well as good very harmonious effects. The music also dives into rather lugubrious ambiospherical phase at the mid-point, before getting out with nervous jingles and finally with percussions very rock where guitar and synth are exchanging some very good solos. Sequences which oscillate deeply, as the reflections of a silvered fish beneath the sun, and lamentations of a synth in mode guitar open the first 3 minutes of "The Island". Afterward, a furious and very rock rhythm harpoons my ears with a bludgeoning of percussions over hyperactive sequences. "The Island" blows rhythm, elements of ambience and a wonderful melody on a structure became scenic with a very lugubrious approach which drops its last charms in a phase of ambient vibes. A title which asks for some listening, so much the explosion of the homogeneity assaults our ears in the first attempt. But it's this splendid melodious manoeuvre which pushes "The Island" towards its last furies which will remain well anchored in the ears. After 3 solids but very solid titles, the bar was high for "Antarctica Base" to ends “Metamorphic Waves” in a good way. The title has half succeed. If the very rock electronic approach is forged by the kicks of the sequencer and the synth solos are weaved in charms, the last 3 minutes are rather kind of candy-pink to the ears with a too ethereal voice for the furies of the guitar solos. But when there is just that which hits a snag… it's like to split a hair in 4! “Metamorphic Waves” is an album of electronic rock which has the pins and needles in one's legs! Its 62 minutes, distributed well on 6 structures, are in evolutionary mode and in constant permutation of the phases of rhythms and of ambient moods. There are few melodies, if it's only moments of storm that fascinate and disturb. Everything turns around hyperactive sequences and percussions, synths as well as guitars, as electric as acoustic which scatter solos, chords and riffs over a well measured electronic rock which makes superb winks to the period of Tangerine Dream's Force Majeure.